Ever since I first watched the behind-the-scenes footage from Lord of the Rings I’ve wanted to try an idea. I heard that they lit this scene with Christmas lights to give it an ethereal feel, so I bought over 2,000 Christmas lights in hopes of using them for a photo shoot. For over 2 years they sat in my closet collecting dust. Finally in July I decided to give it a shot. I wanted to go big and do it up right, so I set a date and got five friends on board to help. 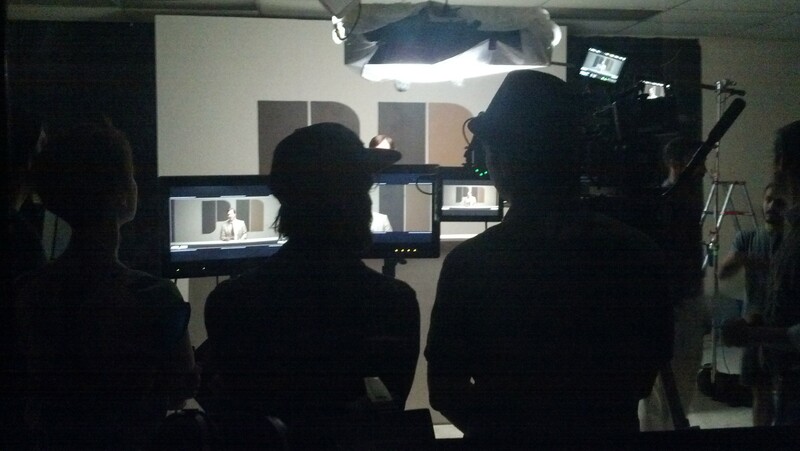 Two models, two assistants, one videographer, and me; tethered shooting, video documentary, and a controlled environment. No elves, sorry. I only had a vague idea of what I wanted to do, but I knew I wanted to create some elegant, mood-lit photos. I was excited and even a bit nervous. Nothing worked the way I wanted it to. I got frustrated and disappointed. I felt like I let my friends down and wasted their time. It was a difficult learning experience for me, and I realized that I still have so much to learn. I need a clear idea of what I want to accomplish. My objectives were too broad and non-descript. Do more researching and testing of the ideas on a smaller scale before taking on something with so many variables. Try only one new thing at a time. 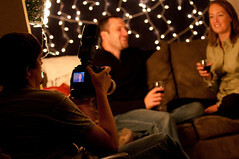 I wanted to do this shoot with awesome light bokeh, starry catchlights, video documentary, and tethered shooting. …and I’ve never successfully done any one of those. Keep the morale up. I got frustrated and disappointed, and it showed. My photos weren’t as good because of it, and I felt like I let my crew down. Distance (from camera to subject to background) + focal length + aperture = size of bokeh. I need a lot of distance (maybe 150 feet from camera to background) and maybe a 300mm or 400mm telephoto lens (or 50mm 1.2) to get the size bokeh I wanted without having to take an extreme close-up. The tiny Christmas lights really don’t put out enough light to be useful for lighting your subject. I need Christmas lights with the screw-in bulbs. I need to rig up a sort of Lite-Brite array of Christmas lights to create patterns for the catch lights. I’m envisioning a large donut shaped rig to shoot through so that the subject’s eyes will have a sparkly ring to ’em. All things considered, I’m glad we did it. I procrastinated for far too long, and it felt good to finally make it happen. I’m glad it didn’t go as well as I wanted it to because if it did I might still think I know what I’m doing. The longer I go without some sort of failure the harder I fall when it does happen. BIG thanks to: Tom and Alana Puskarich, Graham and Sara Marsden, and Jeremy Sexton. Thanks for all the laughs and encouragement along the way! I’m extremely grateful to have supportive and creative friends like you guys! We did come away with a few photos worth sharing; you can find ’em here. 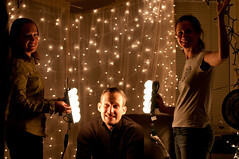 Keep your ear to the ground for rumors of the next Christmas light shoot. I’ll get it right yet!